A new Dungeons & Dragons subclass has paladins swearing a sacred "broath" to their friends and allies. Earlier this week, a Reddit user named "Suner19" debuted a hilarious new subclass on a popular Dungeons & Dragons subreddit. 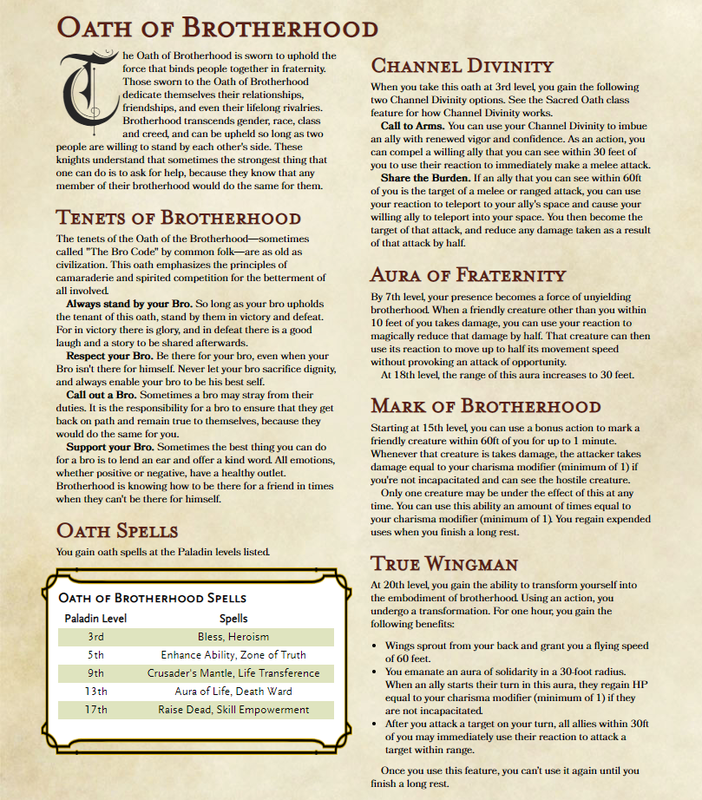 The user presented his brand new "Oath of Brotherhood" subclass, which is dedicated to the defense of the sacred bonds of fraternity. Becoming a Paladin sworn to Brotherhood means upholding the tenets of the "bro code," which include always standing by a bro, respecting a bro, calling out a bro when necessary, and supporting a bro. While the "Bro Code" is most commonly adhered to by men, the Oath of Brotherhood is much more expansive. "Brotherhood transcends gender, race, class, and creed, and can be upheld so long as two people are willing to stand by each other's side," Suner19 writes. The Bro Paladin has several incredibly useful features, all centered around protecting and uplifting one's bros. At Level 3, a player can channel divinity to either have an ally make an automatic melee attack as a reaction or to switch places with an ally when they are attacked by a melee or spell attack. At Level 7, a Bro Paladin's "Aura of Fraternity" allows the paladin to use their reaction to reduce an ally's damage and then move out of harm's way. The Bro Paladin's capstone ability is the "True Wingman" ability, which grants them the ability to fly and causes them to radiate an aura of solidarity that automatically heals all nearby allies and grants them the ability to make a melee attack during the paladin's turn. While the Oath of Brotherhood is presented in a humorous light, it's actually quite well-balanced and unique. It represents a very non-toxic version of "bro culture," one based around platonic and uplifting friendship. This is definitely a homebrew subclass worth trying out in your next Dungeons & Dragons game. You can read through the entire Oath of Brotherhood subclass here. Be sure to let us know your thoughts on playing a bro paladin, or find me on Twitter at @CHofferCbus to talk all things Dungeons & Dragons!